The relationship between hyperactive ALK and Non-Small Cell Lung Cancer (NSCLC) is a relatively new discovery reported in 2007 in the journal Nature by Soda and colleagues in 5/75 patients (https://www.ncbi.nlm.nih.gov/pubmed/17625570) and also by Rikova et al., in the journal Cell in the same year (http://www.ncbi.nlm.nih.gov/pubmed/18083107?dopt=Abstract&holding=npg0. In these cases, ALK is activated as the consequence of a chromosomal inversion event whereby the Echinoderm microtubule-associated protein-like 4 (EML4) is juxtaposed to ALK creating a hyperactive fusion protein. 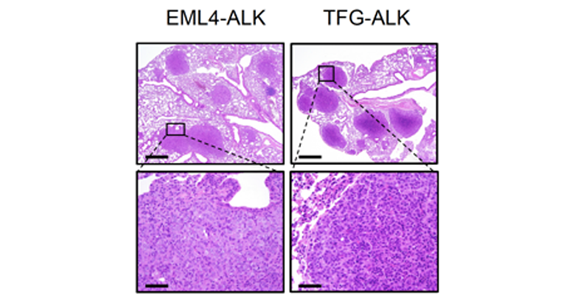 Other, much rarer fusion partners for ALK have also been reported including TFG and KIF5B. Interestingly, this fusion event is more common in patients that have never smoked and is normally mutually exclusive of mutations in the EGFR or KRAS. Patients also tend to be younger in age and present with a form of NSCLC called an adenocarcinoma.